With Misty Knight occupied and poison coursing through his veins, things are looking bleak for Sam Wilson. His only back-up is a new Falcon, who is greener than Kermit The Frog. 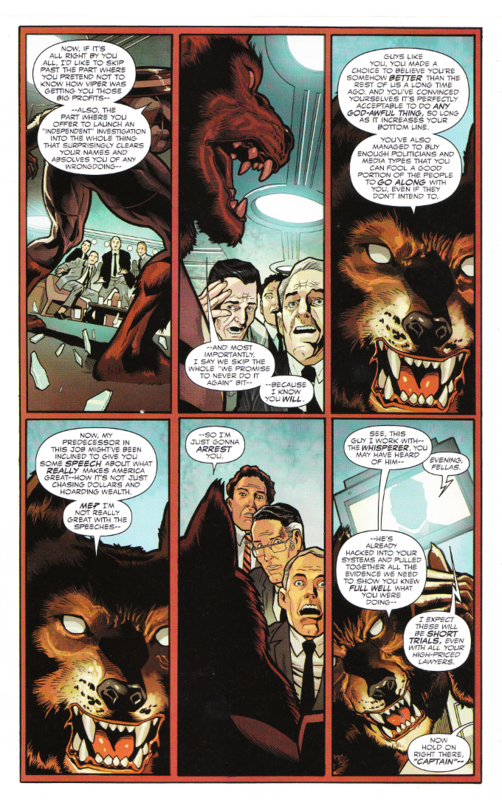 Will the new Captain America - who is still a wolf-man at the moment - meet his end at the hands of the newly formed Serpent Solutions and their dark corporate masters? Joe Bennett and Belardino Brabo are the third art team to tackle Sam Wilson: Captain America since it started. Personally, I find their work here to be the best of the series to date. This is not to say that the other artists were bad - far from it! But there is a smooth precision to the pencils and inks this time that just feels right. And the colors by Romulo Fajardo continue to be excellent. 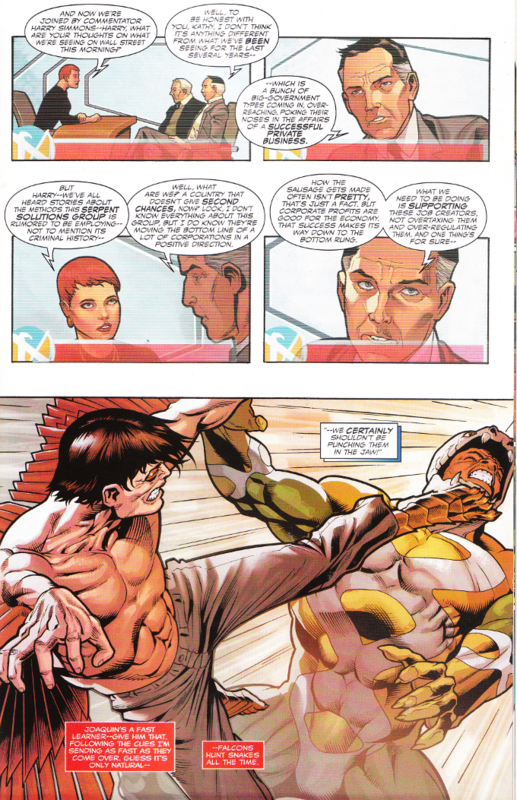 Some have complained that the politics of Nick Spencer's scripts are not subtle. That seems an odd complaint given that the very first issue of Captain America had him punching Adolf Hitler on the cover, at a time when there was serious debate over whether or not the United States might enter the war on the sides of the Axis Powers. Captain America has never been anything but direct.. In in a time when failed businessmen turned reality TV shows can be serious contenders for The Presidency and state governments get away with acts that, had they been committed by ISIL, would have resulted in large portions of the Middle East being turned into glass, Sam Wilson: Captain America is a comic we need. And this Captain America is the hero we need.